On November 23-24 Venture Forum will be held at Congress hotel (Yerevan), within the frames of which the finalist startups of the “EU4Business Science and Technology Entrepreneurship” (EU4Business STEP2) program will pitch their products. 29 startups participate in the final stage of the program. The jury will involve local and foreign experts. 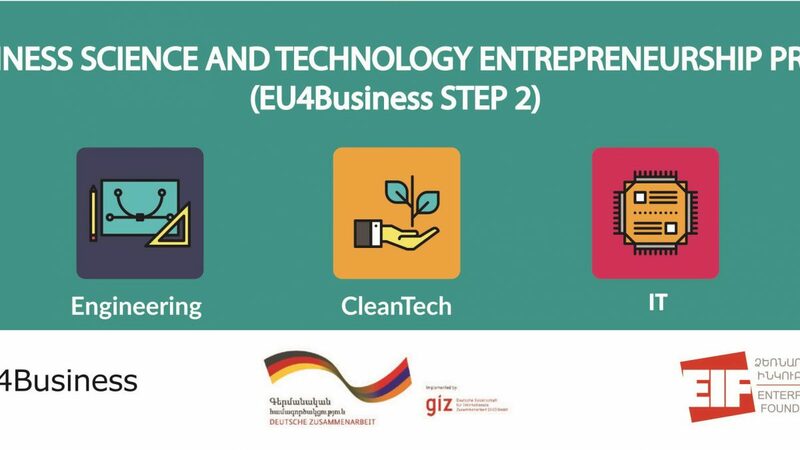 EU4Business STEP2 competition was announced by the “Support to SME Development in Armenia” (EU-SMEDA) project, co-funded by the EU and implemented by GIZ. EU-SMEDA is part of the EU4Business and EU4Innovation initiatives of the European Union. The grant is implemented in cooperation with the Enterprise Incubator Foundation (EIF). The winners will be announced on November 27. They will receive grant between 6,000 EUR and 15,000 EUR, which will be provided with project duration of 6 months. Each company should provide co-financing in the amount of 15%. The award ceremony will be held on November 27 at 6 pm at Congress hotel. The program aims at promoting entrepreneurship and advancing innovative technology-based ideas in Armenia. It is designed to help startup teams, innovators, scientists, engineers, researchers, and entrepreneurs move their products to the market, create new ventures. Before the final stage of the competition, international and local experts, who are active in entrepreneurship development and investments, provided coaching and mentorship to the program finalists. The European Union’s EU4Business initiative is an umbrella initiative that covers all EU activities supporting private sector development in the Eastern Partnership countries. SMEDA is co-funded by the European Union and the German Federal Ministry for Economic Cooperation and Development (BMZ) and implemented by the German Development Cooperation GIZ through the Private Sector Development in South Caucasus Programme. SMEDA aims at improving the business and investment climate and is supporting the creation and development of small and medium enterprises (SMEs) to enable broad-based growth in Armenia. In this realm, the project focuses on SME policy processes, strengthening business associations and economic clusters. Furthermore, the project supports various technology-oriented ventures and helps increase the competitiveness of existing SMEs by providing financial and technical assistance to develop new innovative products and services for domestic and global markets. Additionally, the project aims at stimulating the rate of technology absorption, technology transfer, innovation, and commercialization of research ideas in the private sector, as well as fostering the collaboration between the research centers and SMEs.